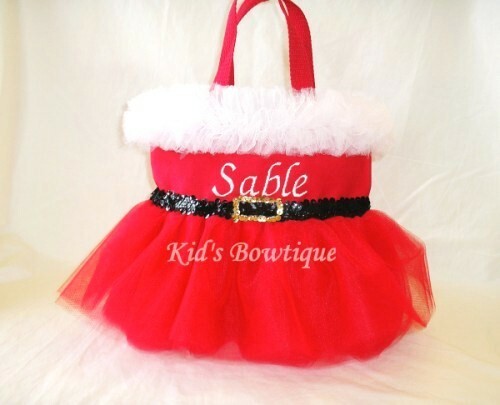 Get into the Christmas spirit with this unique red Christmas Mrs.Santa Claus tutu bag. Carry it as a purse, use as a Christmas photo prop, give as a Christmas gift, use as a gift bag, use it for Christmas home decoration, etc. Many uses for this tutu bag and great for any age. Bag is approx. 10.5 X 8.5 X 2. It is made of red canvas for durability, tulle accents for uniqueness, black/gold sequins belt buckle for dazzle, and embroidery for personalization!